As a yoga teacher I tend to say things like "let go of the judging mind" during class. Yet, as a yoga student, I question this very statement. "Why do we seek to rise above the judging mind? How can one live without judgment?"! Discernment requires immersing yourself in the experience and allowing the conclusion to come to your through the experience. Indeed, Ms. Lasater tells us that “the power of discrimination helps us better understand the nature of reality”. Judgement actually shields our ability to have a direct experience with reality - yet our ability to know the truth demands our direct experience with reality. Here’s an example. Have you ever dumped out a gallon of milk because the expiration date had passed, but never actually tasted the milk to be sure? Who wants to taste sour milk, right? If you threw out the milk - you judged by examining external evidence that the milk had expired - yet you really didn’t know it was. In order to discern the milk is expired, you gotta drink it. Our fear of drinking sour milk - or rather our fear of pain - keeps up judging. The ancient yogis understood this dilemma and created an entire system to help overcome this fear. The system included meditation, chanting, postures, eating habits, and so on. Yet in order to even begin any one of these practices to overcome fear and shed the judging mind, one must have faith that these tools can, indeed, work. Without this faith, you’ll never practice enough to overcome this fear. Essentially yoga demands a huge leap of faith. Once you discover faith, one must practice each method with what Patanjali describes as “a steady and comfortable seat.” Sthira-sukham asanam. Yoga has evolved to mean many things to many people. Without discerning for yourself, you won’t know which method you need today. You must step into the fire and have your own direct experience with reality to find out. Once we are able to overcome the judging mind, does the whole world change? Nope. It’s the same mind. It’s the same universe. It’s the same person with the same story. All that changes from your steady practice is your perspective. Doesn’t sounds so glamorous, eh? Well consider this, enlightenment itself is a radical change in perspective. Chanting is the most primitive form of music and is one tool used by yogis to change our perspective. Music clearly can change one’s mood - with just a few notes a song can send you on an emotional ride into the past. Music can lift you up or sink you down, bring tears or laughter. Music is like medicine, and when applied skillfully has the potential to remove fear and help us find that enlightened perspective we all seek. Take a few moments to chant this thread or sutra - maybe for a minute or two. Then pause and feel it’s effects on the mind and body. When is it important for you in your life to strike this balance between effort and ease? Last week we looked at the idea that ananda, or bliss, while always available to us and indeed found at our essence, it takes work to clear our view - to remove the veil if you will, created by years of bad habits, misinformation or even personal circumstance, to experience andanda or bliss. Lasater provides a classic visual of sutra 3 - carving form stone. She describes, “When carving the sculpture removes everything that is not the statue. The art of revealing beauty lies in removing what conceals it. So too, Patanjali tells us that wholeness exists within us. " Our work is to chisel away at everything that is not essece, not self. Many people come to yoga to relieve pain. And while yoga can certainly help our aching backs and bolster our spirits, it cannot insulate us from the pain that life inevitable brings. If yoga doesn’t relieve that sort of deep, existential pain - why do it? In order to stand in our true nature it takes - you guessed it - hard work, or discipline or abhyasa but also something else vairagya or detachment. From what must we detach? Patajali names five afflictions of the human mind. You may know them? Ignorance, me-ness, attachment, aversion and the will to live. Literally Avidya or ignorance means “actively being in a state of not seeing the true nature of reality.” Abhyasa is not uninterest. Actually its the opposite. Uninterest is when you turn your back on life whereas to be detached is to stand in the middle of life’s frenzy and remain calm and peaceful. Today we eased into the Vinyasa Yoga Book Club idea, picking words of wisdom from the introduction and forward. So for those of you who have yet to pick up your copy of Judith Lasater's "Living Your Yoga" won't be left in the dust. And of course, if you don't plan on following along, still come. Like any good book club, you don't have to read the book to have a great time. Same rules apply at Eyes of the World Yoga Studio 8:15 AM every Saturday for the next couple of months. With 21 chapters, we most likely won't speak to every one (that would take over six months!) but rather, plan to read two-to-three chapters per week - culminating in a book discussion during a Sunday evening in February (TBA). The book chapters are short, well-written gems on yoga philosophy and asana (postures) that will surely show up in your daily life off the yoga mat (and isn't that what we're here for?). Georg Fuerstein, a must-know himself in the yoga community, insists in his first line of the book's forward that the goal of yoga is happiness (ananda), yet he closes his forward emphasizing bravery, courage and discipline to discover that happiness. He writes, "the path toward yoga's lofty goal of Self-realization (atma-jnana) is not in the least glamorous. On the contrary, it is quite humbling. For we must constantly, bravely, and compassionately face our limitations in order to realize our unlimited potential as spiritual beings." Is this a classic 'Catch 22'? Not really. Yoga itself relies on the concept of union of opposites to achieve opening, release and ultimately happiness. It suits this ancient practice that Fuerstein opens in this way - and so lays the groundwork for our inquiry. Lasater in her introduction suggests that if we are to truly live yogicly we must consider every moment, every thought a pose. An opportunity to practice, which she defines as the "consistent willingness to open to life in all of its joy and pain." That our practice off the mat is an exercise in paying "attention to your whole life: your thoughts, your bodily sensations, and your speech and our actions. ... Each moment of your life is a moment of potential practice." Beyond the physical fitness we may enjoy as a result of our yoga practice, we also learn to "respond to life less from patterns of defense and more from integrity." And in order to explore the potential yoga has to offer, we must at a minimum consider removing "layers of doubt, fear, and denial that keep you from experiencing connection with your own wholeness." Consider preparing for next Saturday January 12th class by reading chapters 1 - 3. And if you don't get to it, still come! You'll get a summary and a good stretch. May you discover ananda in this moment. 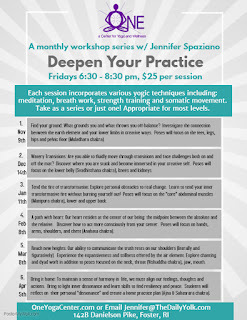 Rhode Island Statewide Initiative ~ January 3rd, 2013: With a great influx of yoga and Pilates studios throughout the state, it’s daunting – and expensive – to decide where to start, or grow, your practice. A Rhody-grown project, the Yoga and Pilates Passport, connects locals with hundreds of hours of yoga and Pilates at numerous studios statewide at an affordable price just in time for New Year’s resolutions. In a local coffee shop early last year, she described an idea to overcome these barriers while building camaraderie among local wellness businesses; to friend, yoga teacher and now co-founder of the Passport Jenn Thomas. In addition to the vast benefits students will experience from practicing yoga and Pilates, Spaziano and Thomas have a vision to improve a studio’s financial sustainability through increased visibility. Indeed, the two have launched a partnership with the Greater Providence YMCA and are offering the Passport at a discount to all Lifepsan employees through an internal wellness program. They hope to expand their partnerships to employee wellness programs at local companies throughout Rhode Island. To support people in making this important decision, Rhode to Wellness is offering a 20% discount in January with coupon code A1780-12 at www.yogaandpilatespassport.com.